Q: Why, briefly, was 1897 the year that defined American journalism? It was a critical moment of experimentation and transition which, in many respects, marked the dawning of modern American journalism. The character and future direction of the field were in play in 1897—much as they are today. Q: So the book has relevance to contemporary journalism? Absolutely. It's not only a book about the past. Rather, it demonstrates how the past can be useful and even reassuring to today's journalists, in confronting the pressures and challenges of a media landscape very much in flux. In many ways, the parallels to 1897 are striking. Q: How exactly is the book relevant to contemporary journalism? The book identifies several important parallels or similarities, then and now. • the sometimes-reluctant embrace of new technology among journalists : Just as some contemporary journalists have been hesitant to embrace the rapid digitization of their field, more than a few journalists in 1897 were reluctant to adopt new devices, such as the type-setting machines as well as the typewriter. By 1897, the typewriter had crossed the threshold of reliability and ease of use and was rapidly gaining favor in American newsrooms. But there were plenty of holdouts. These usually were the more veteran reporters, who were nearly driven nuts by the noisy, clattering, intrusive typewriter. They preferred to write articles by longhand. It was not surprising that they greeted the typewriter with hostility and disdain. At the New York Times , typewriters were reported to have been set up on a felt-covered table in a remote part of the city room, so that the clatter wouldn't bother the older reporters. • a tendency to exchange insults in print and to disparage innovative new media : Consider the hostile and heated exchanges this summer between the Wall Street Journal and the New York Times over the Times ' national-security disclosure. Insults were traded routinely among American newspapers in the late 19th century. What is probably the most-used sneer term in journalism—“yellow journalism”—first appeared in print in 1897, in the old New York Press . The term was used then to disparage the so-called “new journalism” pursued by William Randolph Hearst and his New York Journal . The abuse directed at Hearst and his “new journalism” reminds me quite a lot of the venom that today's mainstream media often aim at blogs and bloggers. A commentator for NPR last year referred to the blogosphere as “an amoral place with few rules.” That sort of mean-spirited commentary often appeared in the editorial pages and news columns of newspapers in 1897. • a reminder that the appeal of activism lies close to the surface of American journalism : Despite the model of detachment and impartiality that nominally guides mainstream American journalists, the temptation to take an active role in public life is never far from the surface. Consider the so-called “civic journalism movement” of the late 1990s: It envisioned the news media as active agents in reinvigorating democratic life in America. That's quite reminiscent of the activist model that Hearst and the Journal advanced in 1897. He called it the “journalism of action,” and argued that newspapers were obliged to inject themselves, conspicuously and vigorously, in righting the wrongs of public life and in filling the void of government inaction. Hearst and the Journal really believed in and pursued this vision of activist journalism. There was no more dramatic or celebrated manifestation of the “journalism of action” in 1897 than the jailbreak they organized to free a 19-year-old female political prisoner in Havana named Evangelina Cisneros. Nothing quite like the Cisneros jailbreak has happened since in American journalism. But that kind of journalistic activity, were it to happen these days, would be roundly condemned as unethical, illegal and amoral. So in an ethical context, the most dramatic moment of activist journalism in 1897 offers a benchmark about how journalism has changed—and in this case for the better. • a reminder of the similarity in criticism of media performance : At the same time, there are striking similarities in the critiques of the news media and their failings. One of my favorite characterizations of the press in 1897 appeared in a journal called The Dial . It lamented the “decay” of American journalism and said it was an “undeniable fact that most of the newspapers published in our large cities are so devoid of principle that they constitute a perpetual menace to every genuine interest of our civilization.” That sort of over-the-top critique isn't at all alien today. In fact, it wouldn't be surprising at all to encounter such an assessment. The press in 1897 was also frequently criticized for publishing sensational content—another critique that resonates today, when “yellow journalism” is commonly invoked by letter-writers to newspapers in condemning all sorts of journalistic malpractice. In 1897, one commentator criticized the press for a “lamentable lack of fairness in everything that touches upon political opinion.” The news media these days are often assailed for a “lamentable lack of fairness.” So in terms of assessing the failings and shortcomings of the news media and their practitioners, the similarities across time are striking. Q: Those are five striking parallels, then and now. Are there others? As the book makes clear, the practice of “ parachute journalism ” in international correspondence was practiced long before there were airplanes. While they didn't call it “parachute journalism,” the widely traveled correspondents in 1897 certainly practiced it. They traveled on high-speed trains and ever-faster ocean liners to reach major international events rather quickly. The itinerant journalists of 1897 included prominent writers such as Stephen Crane and Richard Harding Davis. But by far the best-known itinerant foreign correspondent in 1897 was Sylvester Scovel, a cocky, self-promoting reporter for the New York World whose name and exploits are mostly forgotten today. Scovel's assignments in 1897 year traced the arc of the year's most important international developments. He began the year by traveling to Cuba, the theater of the rebellion against Spanish rule, and made his way to the camp of Cuban insurgents. That was illegal under Spanish law and Scovel was arrested while trying to smuggle his dispatches out of Cuba to New York. He was thrown in jail and the World launched a high-profile campaign for his release, saying he was in imminent danger of being summarily executed. But that was hardly the case. Scovel's jail cell was jammed with comfortable furnishings. He received huge meals prepared by the wife of a local U.S. consular agent. The luxury of Scovel's confinement was almost absurd. Scovel spent about a month in jail before the Spanish sent him home. He got married and was sent him to Europe, without his bride, to cover the brief war between Greece and Turkey for the World . He missed the war's decisive battle and then returned to the States. In mid-summer 1897, Scovel was sent to Alaska to cover the unfolding gold rush to Canada's remote Klondike. Unknown to the World , he took his bride with him this time. Scovel and bride wrapped up their year with a return to Cuba to report on the deteriorating human rights conditions there. Cuban non-combatants were forced into what the Spanish called “reconcentration” centers, where many of them died of disease and malnourishment. Q: So what do all these parallels tell us? They're interesting, but are they important? They offer a useful framework for considering the upheaval in the field these days. It's useful and important for journalists to be a bit humble about the contemporary trends and turmoil. While the players and the platforms are certainly different, many of the underlying themes and challenges in journalism are not entirely new. Q: But what do you mean, “journalism … emerged the stronger for it”? That is a reference to a three-sided “clash of paradigms” that emerged in 1897. A chapter in the book is devoted to describing this clash in detail. Essentially, American journalism in 1897 came face-to-face with a choice among three rival and incompatible visions—or paradigms—for the profession's future. The emergence of these rival visions is central to the exceptionality of 1897 , because the choices that materialized then set a course for American journalism in the twentieth century, and beyond. Easily the most dramatic of the three paradigms was Hearst's “journalism of action.” The antithesis of that model was the conservative, counter-activist paradigm represented by the New York Times and its lofty commitment to “All the News That's Fit to Print.” The Times model emphasized the detached, impartial, yet authoritative treatment of news—and it is still the normative model that defines mainstream journalism in this country. As the book notes, “The three-sided clash of paradigms that emerged in 1897 was framed by an exceptional convergence of personality and opportunity.” Hearst, Ochs and Steffens were all in their thirties in 1897, and they were all eager to experiment, to try and take the field in new directions. But it would be years before the “clash of paradigms” was resolved and, as I say, it resulted in the ascendancy of the Times ' model of detachment and impartiality. 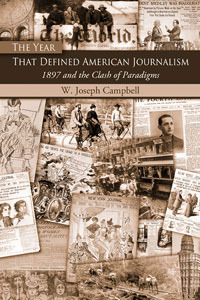 It was the model proved best able to absorb and accommodate the multiple stresses and pressures that were reshaping American journalism at the end of the 19th century. Q: The “clash of paradigms” did not take place in a vacuum, presumably. Was 1897 a time of transition in other ways, beyond journalism? The cinema was emergent then. Motion pictures were in their “novelty year” in 1897, according to one leading historian of the cinema. The presidential inauguration of William McKinley in March 1897 was the first to be captured on film. For the first time, a motion picture camera was taken to war—the Greco-Turkish War—in 1897. They may not have used those exact words, but Americans in 1897 believed quite thoroughly that they were participating in “something out of the common.” And to head for the Klondike was, for many American, “doing something out the common” on a grand scale—perhaps the grandest scale imaginable. Q: Speaking of “doing something out the common”—were there any notable “firsts” in 1897? There were. The first section of America's first subway opened Boston in 1897. It about a mile-long stretch beneath Tremont Street in the heart of the city. The New York Times said that it was “remarkable” that such a “conservative an American town” as Boston would be the first in America to build and operate a subway. The first Boston marathon was run in 1897. It is now the most famous and most prestigious race of its kind in the United States. But back then, it was something of a lark. Fifteen men entered the race and the old Boston Post noted that some of the runners “looked as if they could spare a few pounds.” The winner from an athletic club in New York. The course was shorter than it is today and he finished the race in 2 hours, 55 minutes, and 10 seconds. The Boston Globe said the winning time was a world record, breaking the standard set at the 1896 Olympics in Greece, where the marathon race was revived. Q: What were some of the more bizarre events back then? In the spring of 1897, there were numerous reports from across the Midwest of what we would call UFOs. These were sightings of mysterious “airships” that seemed to alter form and shape with every city or town they passed. In Topeka, Kansas, the airship “resembled a fish composed of a complex frame of steel rods,” according to the Chicago Tribune . In Evanston, Illinois, it appeared to be “a veritable ship of the air, with masts and yards, sailing under a cloud of canvas,” with colored lights suspended from rails. The notion of extraterrestrial life wasn't far-fetched at all in 1897. Leading astronomers of the time believed that the surface of Mars was crisscrossed by a network of canals. And in 1897, H.G. Wells was completing his science-fiction thriller, The War of the Worlds . Pre-publication excerpts of Wells' book appeared in U.S. newspapers late in the year. Football was pretty rough then, too. The sport more resembled rugby than contemporary American football. A few players died from football injuries in 1897 and many more were badly hurt. But the sport was very popular at the collegiate level. The national champion in 1897 was the University of Pennsylvania team, which compiled a 15-0 record. Penn that year scored 463 points and gave up just 20. Twelve of its opponents never scored a point. It was quite a juggernaut team. Q: Back to the journalism of 1897: Were the decisive and defining developments you discuss mostly evolutionary, or were they the result of sudden insight and inspiration? The most important technological breakthrough in journalism that year was the process for printing halftone photographs in the main sections of newspapers while they were published on high-speed presses. Many people thought such a process was impossible—that halftones simply couldn't be embedded into the printing process used by big-city newspapers. But in January 1897, the New York Tribune demonstrated that it could be done. The importance of this development cannot be understated: It led to nothing less than recasting the appearance of American newspapers. Most newspapers in the late 19th century crammed as many stories as possible on their front pages. Many of these were brief items. 10 February 10, 1897, the day “All the News That's Fit to Print” first appeared adjacent to the newspaper's nameplate, the New York Times offered twenty-seven articles on its front page. But the crowded, chaotic makeup of newspapers changed dramatically with the ready use of halftones. The halftone process allowed the newspaper to become a more vivid, more visual medium—and encouraged the ascendancy of graphic illustrations in newspaper design. Q: Is there an example of a defining moment in journalism in 1897 that sprang from sudden inspiration? The editorial was written by Francis P. Church, a veteran journalist who relished the anonymity of editorial-writing. Church's authorship of “Is There A Santa Claus?” wasn't disclosed by the Sun until after his death in 1906. By all accounts, Church wrote the editorial in the course of a day's work, without a hint that it would become a classic, or that it would ensure him, posthumously, the fame he never sought in life. Q: But why was a Christmastime editorial published in September? That's an interesting question—and the source of a small mystery that the book tries to clear up. Christmas and Santa Claus were not in the news in late summer 1897. If those topics were in the news then, that might have prompted the editorial. But that's not the case. The most plausible explanation for the odd timing was the excited speculation of the 8-year-old girl who wrote to the Sun , inquiring about the existence of Santa Claus. Her letter prompted the editorial. The little girl was Virginia O'Hanlon. Many years later, after a very successful career in secondary education in New York, she recalled that after celebrating her birthday in mid-summer, she began to think about the gifts she might receive at Christmas. “I just existed from July to December, wondering what Santa Claus would bring me,” she told an audience in Connecticut in 1959. So sometime after her 8 th birthday, Virginia took the advice of her father and dashed off a letter to Sun , imploring the newspaper to “tell me the truth; is there a Santa Claus?” And then she waited for a response. And waited. And waited. And finally she gave up waiting and forgot about her query. Much to her surprise, the Sun on September 21, 1897, answered her letter with the now-famous editorial. Q: And the editorial was an immediate hit, right? It's generally believed that it was, and that it was reprinted by the Sun at every Christmas season after 1897. But the accepted wisdom is incorrect. As is discussed in the book, the famous editorial was reluctantly embraced by the Sun . By the 1920s, the Sun was reprinting the editorial every year at Christmastime. In the final analysis, the newspaper had yielded to its readers and tacitly acknowledged that editors are not always as perceptive as readers in recognizing journalism of significance and lasting value. Q: What was the single most dramatic event in journalism in 1897? That had to have been the Cisneros jailbreak in Havana, organized by Hearst's New York Journal . I alluded to this case earlier. It was truly an amazing episode, but one that has been largely forgotten. When it is remembered, the Cisneros jailbreak is usually dismissed as a hoax or a “put-up job” in which well-placed bribes made the dramatic escape possible. My research indicates otherwise: It was not a hoax, it was not a “put-up job.” Rather, the Cisneros jailbreak was the successful result of an intricate plot in which clandestine Cuban operatives and U.S. diplomatic personnel filled vital roles—roles that remained obscure for more than 100 years. Evangelina Cisneros was jailed for conspiring against the Spanish military, which was then trying to put down a rebellion across much of Cuba. She was accused of conspiracy to commit murder, and was kept in jail for more than a year without trial. Hearst and his Journal learned of the young woman's plight and mounted a noisy petition drive calling on Spain to set her free. The Journal characterized her as a Cuban patriot, guilty only of “having in her veins the best blood in Cuba.” The Journal also described her jailing as typical of Spain's cruel treatment of Cuban women. In any event, thousands of American women signed petitions, some of them quite prominent such as Julia Ward Howe and the mother of President McKinley. But the Journal 's petition drive failed. Spain refused to budge. So Hearst decided to rescue her and sent a Washington-based reporter named Karl Decker to Cuba with orders to do so. Decker was nominally the Journal 's correspondent in Havana. He was also secretly at work on plans for the jailbreak, and he tapped into a clandestine network that smuggled arms and medicine into Cuba and, on occasion, smuggled people off the island. U.S. diplomatic personnel also gave quiet support to the jailbreak, which took place in the wee hours of October 7, 1897. Cisneros ended up marrying one of the Cuban operatives who helped in the jailbreak. And she lived into her 90s. Nothing quite like the Cisneros jailbreak has ever happened again in American journalism: Nothing quite so audacious, or lawless, has ever been undertaken by an American news organization. That's another reason why 1897 was an exceptional year in American journalism. Q: What's the value of a “year study,” other than it hasn't been attempted before in journalism and media studies? It is interesting to note how popular year studies have been in other fields. Consider David McCullough's best-selling 1776 , for just one example. Other year studies have focused on 1000, 1215, 1759, 1912, 1919, and 1968. Sometimes, even a single month, or single day, has been the subject of book-length treatment. Because they tend to be sharply focused, year studies can clarify issues , trends, and developments that otherwise might remain obscure in the sweep of history. For example, the keen interest many American newspapers took in Hearst's “journalism of action” is rarely recognized by historians. The Year That Defined American Journalism demonstrates that the “journalism of action” attracted considerable interest among journalists in 1897—including some of Hearst's rivals and foes. It was even seen as force for taking on political corruption and the monopoly interests that were gathering strength at the close of the 19th century. While the appeal of the “journalism of action” is typically overlooked in studies of journalism of the 1890s, a year study throws that appeal into sharp relief, and demonstrates that Hearst, at least early in his career, was far more innovative than historians have recognized. So those are the kinds of benefits a year study can produce. A year study also can freeze-frame key moments in the trajectory of longer-term change, and allow those key moments to be examined in detail. An example of this is the breakthrough in halftone technology in 1897—the development of the process that allowed photographic images to be printed in the main section of a newspaper as it was published on high-speed presses. The Year That Defined American Journalism addresses that important breakthrough in some detail. Q: In closing, for what audience is The Year That Defined American Journalism intended? Really, for anyone interested in American journalism and how it came to be practiced as it is today. Such an audience would include professional journalists, certainly, as well public relations practitioners, media analysts and pundits, journalism scholars and other historians. It's should be very useful as a supplementary text in graduate and undergraduate classes.